Dietary requirements for breakfast should be communicated before arrival. A maximum of 2 different options of breakfast can be offered. The Palapa style huts provide an authentic Mayan accomodation experience (with added comfort) as well as a cool place to sleep and relax after a day of exploring Tulum's beaches, Cenotes and Pueblo. 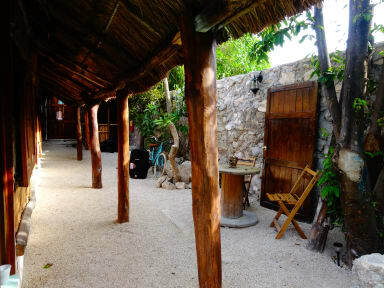 Famous for our creative and delicious breakfasts, chilled family atmosphere, and best local advice and secrets, this is truly the best place to stay in Tulum. 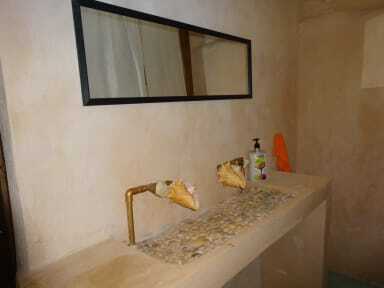 We have 4 dorms with the choice of 4, and 8 beds, each equipped with a separate bathroom and hot shower. Each of our beds feature a power socket, a reading light, a fan and a security box (while fitted curtains give you a feeling a privacy just like home (well almost)). The 4 bed dorm has Air Conditioning. The shared kitchen, indoor and outdoor areas are great spots to mingle, kick up your feet and chillax. In addition we will treat you to a great breakfast to kick-start your day and free WiFi to stay in touch with your loved ones or just browse. Nice hostel with even nicer staff; super friendly and knowledgeable. Bikes for rent for very cheap compared to bicycles rentals around town. I was only there for two nights but each morning there was a different breakfast with coffee and tea. Amazing place. Would recommend. Great hostel and very nice atmosphere. We would definitely stay there again! The beds are comfi and we got a double bed in a dorm. Everything was clean and the staff was awesome! There is nice (and always different) breakfast in the morning. Basic hostel but with very nice atmosphere. Staff was friendly and helpful. Breakfast was different every day and tasted really good. Would go there again. I really loved Chill Inn - they made sure I got checked in and settled, the bed was comfortable, and everyone was very friendly. Breakfast in the morning was incredible - mushroom crepes with cream sauce! I didn't expect that level of culinary expertise in the kitchen but I really appreciated it. Also, they let me store my bags after checkout to go on a little day trip. I have never been more impressed with a hostel - I can't wait to come back and stay again! Great place with great people! Super chill and comfortable, you’ll feel like your in a home away from home. Breakfast was okay. There are toilets and showers in the dorm rooms, but the ventilation is not so good. Therefore the dorms can smell like sewer. The hostel could be really nice, it has a good vibe and a relatively central location but it was really dirty when we arrived. Also the whole dorm was stinking cause the toilet was broke.